Want to save yourself hundreds of hours searching for free resources to build your website? 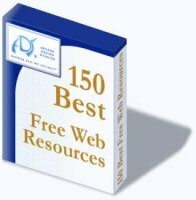 Get your copy of “150 Best Free Web Resources” right now! This ebook is more than a list of the very best free products and services that the Internet has to offer. It’s also a step-by-step guide to building a successful — and profitable — website in 2006. If you use the advice and free resources that I give you in this ebook, and it doesn’t save you ten times its price within a year, I will give you a full refund — with no questions asked! Everything you need to build a free website! and many more web resources — all of which are 100% free! It would literally take you hundreds of hours to find all of the different resources that I’m giving you in this ebook — if you even knew that they existed. Now you can spend that time on building your website instead. This is the only source I know of that gives you all of this information in one place. Even Internet marketing courses costing thousands of dollars don’t have the free tips I’ve included in this book. As a special offer when you buy 150 Best Free Web Resources, I’m also giving you another free bonus handout on turning your visitors into cash. It’s called “Monetizing Your Website,” and it tells you my top secrets for turning your website into a passive stream of income. This bonus alone is worth seventy-five dollars — and it has the potential to earn you thousands of dollars of income from your site. With all of the information I’m giving you here, I could easily charge over a hundred dollars for this package — and it would definitely be worth that price. But I believe in helping new entrepreneurs get started on the Internet, so I’m going to give you a great deal, so that you can use all of the very best free resources that I know of to build your own online business. This is the exact same list that I personally use to build great websites. It has taken me many years to find, test and compare all of these services, and now I’m handing them to you for only $14.97. Remember, there is absolutely no risk to you. ....just let me know and I’ll give you a complete refund, with no questions asked. That’s my ironclad guarantee that this ebook will show you how to make huge profits on the net!